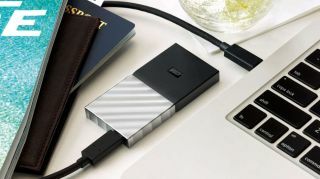 Western Digital has launched its first ever portable SSD, a neat and compact device which promises a ‘blazing’ turn of speed, according to the firm. The WD My Passport SSD comes in capacities of 256GB, 512GB and 1TB, and it’s certainly no slouch, offering read speeds of up to 515MB/s (which makes it the fastest drive in the My Passport range). It hooks up via a USB-C port (USB 3.1 Gen 2) and comes bundled with the appropriate cable, along with an adapter to ensure compatibility with older USB-A ports. The drive’s silver and black enclosure measures 45 x 90mm, and it’s 10mm thick. Not only is this SSD compact, but it can also take a knock. WD says it can survive a 6.5-foot drop, and in terms of shock resistance it has been tested to withstand 1500G of force. On the security front, you get 256-bit AES hardware encryption, and the drive is password protected for extra peace of mind when it comes to keeping your precious data safe. You also get WD Backup software for set-and-forget duplication of your important files, and it is indeed compatible with Apple's Time Machine in MacOS and OS X. The My Passport SSD comes with a comforting three-year warranty, too, and prices for the 256GB, 512GB and 1TB models are $100 (around £80, AU$132), $200 (around £160, AU$265) and $400 (around £320, AU$530) respectively. The drives are available now over in the US.